The Taiwan Power Company (Taipower), with its monopoly on power provision and about 60 percent of the nation's energy production, has had some of its antics brought into the open. During Wild Director Robin Winkler's term as commissioner on the Taiwan Environmental Protection Administration's Environmental Impact Assessment commission, the first and second phases of a proposed power plant for Taipower were reviewed. 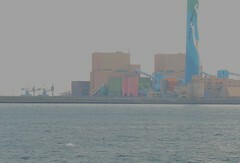 The proposed plant, in addition to being located midway between the world's first and fifth largest emitters of CO2 would have severely exacerbated the already severely polluted west coast of Taiwan, home to the small and unique critically endangered endemic sub-species of the Indo Pacfic Humpback Dolphin. On the day following the submcommittee's rejection, Robin was approached at the EPA during another Taipower case by a Taipower employee who, in a very serious voice, said, "What are we going to do? We already signed the contracts to purchase the equipment for the plants." Taipower has a reputation for having engaged in illegal and irresponsible practices for years. While the Democratic Progressive Party was in power, some of those shenanigans started to come to light. But now that the old Chinese National Party KMT is back, the sorts of coincidences reported here are likely to become more commonplace. The world's dirtiest power plant, Taipower's Wuchi Power Plant, through the haze. A critically endangered Taiwan Humpback Dolphin is shown swimming in the bottom left. Taiwan's national power company, Taipower, under the leadership of the Ma Ying-jeou Administration, has been alleged to have purchased overpriced fuel coal, causing protracted overpricing of power bills to the country's consumers. Strangely enough, just as Taiwan's national governmental watchdog body, the Control Yuan, was preparing to launch an investigation, the storehouse in which Taipower keeps the files of its external purchasing contracts was burglarized. Even stranger, the only documents stolen in the burglary were the fuel coal purchase agreement documents. The peculiar circumstances of the theft have led to speculation that the burglary was aimed at making evidence disappear. According to a report in the latest issue of Next Magazine, the Consumer's Foundation had asked the Control Yuan earlier this month to investigate concerns that continuing high power prices, despite a recent 44.65 percent drop in fuel costs, might indicate foul play. Although the prices of liquefied petroleum gas and fuel oil have both fallen considerably, Taipower has refused to lower power prices, which have gone up twice this year. These circumstances have led the Consumer's Foundation to suspect negligence or malfeasance by Taipower and Ministry of Economic Affairs, prompting the request for a Control Yuan investigation. The Control Yuan member on duty the day the Control Yuan filed its request, Cheng Jen-hung, formally opened a Control Yuan case with a written recommendation for an on-site investigation. In the lead-up to the investigation, Taipower stated its case to the Control Yuan, but the Control Yuan found the explanations unsatisfactory. Just as the formal investigation was about to get underway, Taipower's document storage room was burglarized, and the document stolen was an important piece of evidence targeted in the Control Yuan investigation. The theft of the document has further fed suspicions that behind-the-scenes forces are at work in the case.